Non-medicinal ingredients: ascorbyl palmitate, soy lecithin (non-GMO), maltodextrin, microcrystalline cellulose, silicon dioxide, stearic acid, sodium stearyl fumarate. Capsule: hypromellose. AOR™ guarantees that all ingredients have been declared on the label. Contains no wheat, gluten, nuts, peanuts, sesame seeds, sulphites, mustard, dairy, eggs, fish, shellfish or any animal byproduct. Pro Curcumin uses Solid Lipid Particle (SLPTM) technology to provide the most bioavailable free-form curcumin available on the market. This technology makes the curcumin particles gastric resistant, enhances their absorption through the gut and through cell membranes, and spares them from phase II detoxification in the liver. Pro Curcumin works quickly to help relieve severe pain and conditions that stem from inflammation, such as arthritis and chronic pain. Studies have shown curcumin is as effective as various common NSAIDs (non-steroidal anti-inflammatory drugs) in osteoarthritis sufferers, and also has fewer side effects. Additionally, curcumin provides powerful antioxidant, cognitive, and anti-aging benefits. 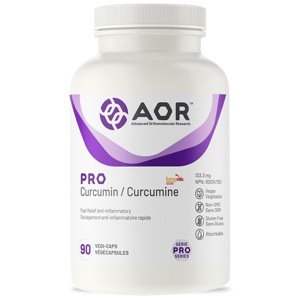 Pro Curcumin consists of optimized curcumin which exists as free-form curcumin in the body, and is taken up into the cells easily. This means that it delivers all of the health benefits of curcumin much faster than other curcumin products. Adult Dosage: Take 1 to 2 capsules daily with/without food. Caution: Caution in patients taking antiplatelet medication or blood thinners, or those with gallstones, a bile duct obstruction, stomach ulcers or excess stomach acid. Reassess if symptoms persist or worsen.